Starting a business? Don't sweat it! 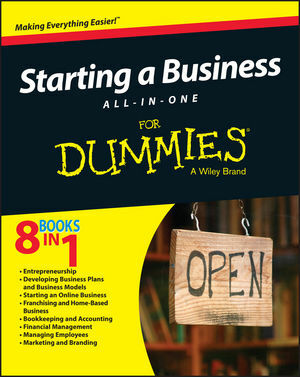 Reflecting today's unique opportunities and challenges, Starting a Business All-In-One For Dummies is packed with everything you need to manage your personal and business risks and successfully navigate your first year in business. Written in plain English and packed with simple, step-by-step instructions, it shows you how to start up your dream business from scratch, write a winning business plan, secure financing, manage your risks successfully, navigate your first year of operation, and much more!